Trends have changed and not all women dream of their big day anymore since they are little girls. But the day in which you get married is still definitely an important one in your life, whether you dreamt of it as a child or not. Bridal designers try to create unique pieces so that their dresses fit any desire of the future brides, be it that they want to get married in a princess or a deux pieces suit. 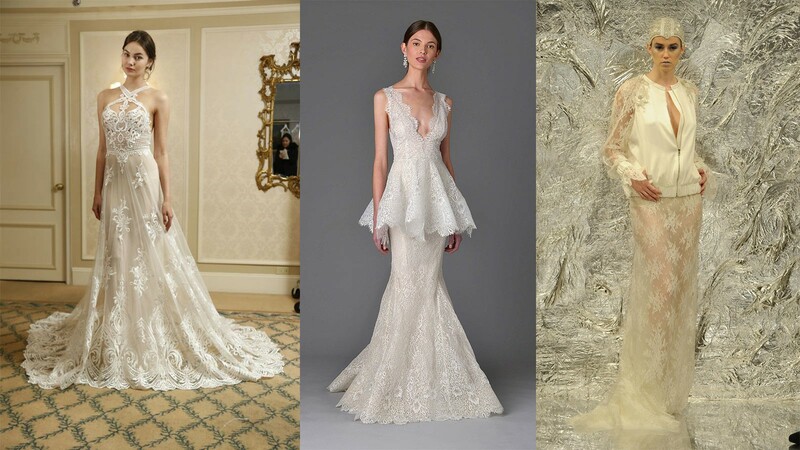 If you are a designer and you want to stay up to date to the trends of the Spring Summer 2017 collections, we have put together a list of our top 5 lace choices to inspire you to create dresses for any kind of bride. Ines di Santo, the designer, is the perfect mix between the Italian and the Argentinian heritages and it can be definitely be seen in her collections. This sleeveless gown is a truthful interpretation of a bride that is not scared away of looking strong and sure of herself. The V neck gives an extra touch of boldness, while the flowers gently soften the look. Is is paired with a long sleeve coat with the same floral pattern. Alon Livne White, the bridal line of the Israel’s most famous and loved designer, Alon Livne, is one of the most admired bridal collections in the world. The dress we chose of the Spring 2017 collection makes us think of an adorable, yet very feminine goddess walking down the aisle wearing a golden flowers crown. We particularly love the way the pattern runs from up to the lower edge of the dress, giving it a very fluid look. If you are looking for something different, than most definitely Theia is the designer you should draw inspiration from. The Spring 2017 collection is actually an interpreted version of the underwater photos of Rafael Makiela. However, our choice is more of a down to Earth, uber cool and bold bride that is not shying away from putting together a bomber jacket and a long lace dress. If you thought that no one makes wedding dresses for romantic brides anymore, you were wrong. The Greek designer, Christos Costarellos, is doing it and it is simply sublime. Costarellos who is becoming more and more notorious chose a no pattern all white skirt perfectly combined with a lovely and detailed lace long sleeve top. Last but not least, Marchesa. Of course it could definitely not not be part of our choices. The brands designers, Georgina Chapman and Keren Craig, are the ultimate gurus of understanding and anticipating the needs and desires of modern brides. However, their Spring 2017 collection is a revival of the fairy tale inspiration motifs. We fell in love with the dress named The Lavander. Against its name, the dress is a gorgeous mix of ivory cotton and lace. 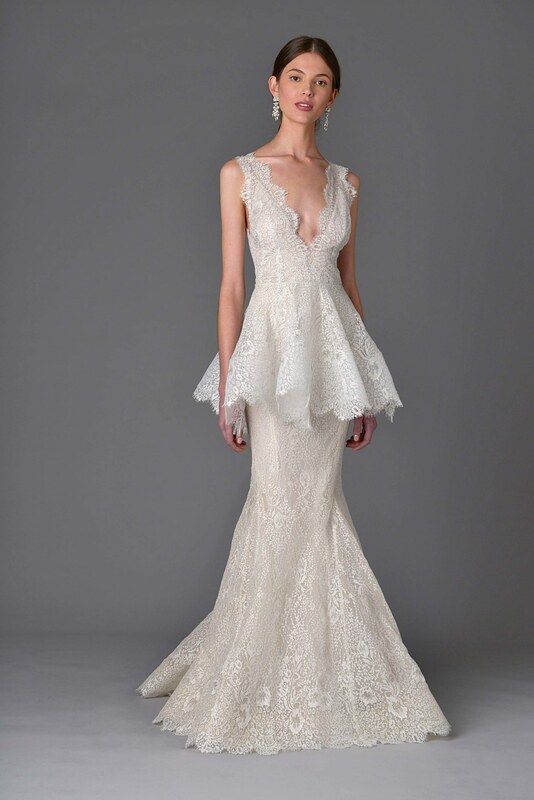 This entry was posted in Wedding laces and tagged Alon Livne, bridal dress, bridal gown, bridal lace, Christos Costarellos, fashion trends, Ines Di Santo, Marchesa, Rafael Makiela, Theia, wedding dress, wedding lace.